The Case IH Quadtrac 620 is “Machine of the Year 2014” in the XXL tractor category. 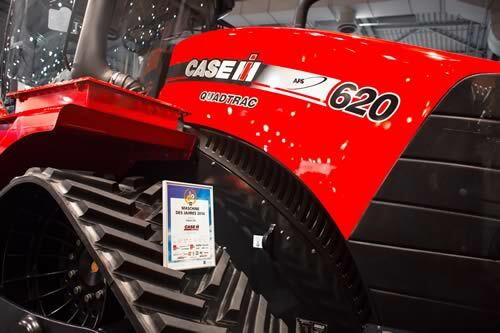 On the third evening of this year’s Agritechnica exhibition in Hannover, the industry accolade „Machine of the Year 2014“ was awarded to Case IH in the presence of well over 600 participating guests. The highly coveted trophy, which has become an important recognition of achievements in the industry, was awarded because of the innovative concept of the new Case IH Quadtrac series. In his laudation agricultural editor Bernd Feuerborn not only acknowledged the nearly 700hp maximum and a torque of up to 3,000 Nm but also highlighted the excellent driving comfort of the most powerful series tractor produced worldwide. The Quadtrac tractors feature the largest cab in the industry and an unsurpassed surround vision. The surveyor™ cab offers an exclusive suspension system which balances and absorbs any forward, sideways or seesaw cab movements, thus providing superior operational comfort and control. All Quadtrac tractors are powered by the new FPT Industrial Cursor 13 engines. This 6 cylinder power source with a capacity of 12.9 litres and two intercoolers, enables a significant improvement in the thermal efficiency of the engine. The new Quadtrac series, presented at Agritechnica for the first time, is one of the first high performance tractor series to fulfil the tightened Tier 4 Final/Stage IV emission regulations with an SCR-only system. The newest generation of the Case IH Efficient Power System featuring new and patented exhaust treatment technologies is used to achieve these results. The new engines with the unique HI-eSCR technology deliver optimised combustion, thus ensuring that the Case IH Quadtrac continues to stay in the lead with regard to fuel efficiency. The patented technology not only provides outstanding cost-effectiveness but also NOx transformation efficiency of 95 percent – setting the standard in the industry. The engines are aligned to deliver maximum performance without increasing emissions or reducing effectiveness.